Before pasteurisation all milk was raw milk. Historically, although there are well documented health benefits associated with drinking raw milk, there were also health risks with drinking raw milk. These were particularly tuberculosis, brucellocis, and bad bacteria such as Salmonella, E. coli and Campylobacter. When pasteurisation was introduced, it sterilised the milk of these harmful elements. It is for this reason the Food Standards Agency Health Warning "This milk has not been heat treated and may therefore contain organisms harmful to health" must be put on the bottle. Raw milk and pasteurised milk are totally different. In fact you could almost say that they only have two things in common, they are both fairly white in colour, and both called milk! The more you understand raw milk, the more you realize what an amazing food it is. Before pasteurisation, raw milk had associated health risks. Tuberculosis and Brucellosis were found in many herds at the time, and these diseases could be passed on through the milk. Also, the actual milking process was very basic allowing contaminants into the milk that contained bad bacteria such as E.coli. So there were problems many years ago. But what about today? In the UK, Tuberculosis is still a big problem in most of Wales and the Southwest. However, in the late 1970s, the UK became free from Brucellocis following a nationwide eradication programme. Our Hailsham Herd established in 1959 has always been TB and Brucellocis free. Todays herds are milked in a hygienic environment, using advanced milking equipment that is kept sterile. We pay fantastic attention to hygiene to ensure the strict bacteria tests conducted on the milk by the Food Standards Agency are easily met. Today, our milk is regularly analysed and milking plant regularly inspected to ensure that the cleanest milk is produced. In this way all the benefits of the good bacteria in the milk are kept, without having any of the problems associated with bad! This is the physical smashing of the milk fat particles into smaller fat particles, so that the fat particles do not rise to the top, but remain in even suspension throughout the milk. This ensures the colour is consistent (there is no cream at the top of the container, or cream line). However, there are health concerns that the body cannot deal with these very fine fat particles that can pass straight into the bloodstream causing health problems. Why Is Our Raw Milk Safer than Raw Milk Before Pasteurisation? Before pasteurisation, raw milk had associated health risks. Tuberculosis and Brucellosis were found in many herds at the time, and these diseases could be passed on through the milk. Also, the actual milking process was very basic allowing contaminants into the milk that contained bad bacteria such as E.coli. So there were problems many years ago. But what about today? In the UK, Tuberculosis and Brucellocis are virtually eliminated from all herds following an eradication programme over the last few decades. Our Hailsham Herd established in 1959 has always been TB and Brucellocis free Todays herds are milked in a hygienic environment, using advanced milking equipment that is kept sterile. We pay fantastic attention to hygiene to ensure the strict bacteria tests conducted on the milk by the Food Standards Agency are easily met. Today, our milk is regularly analysed and milking plant regularly inspected to ensure that the cleanest milk is produced. In this way all the benefits of the good bacteria in the milk are kept, without having any of the problems associated with bad! "Raw milk contains multiple, redundant systems of bioactive components that can reduce or eliminate populations of pathogenic bacteria. One of our customers has a child who had a lump caused by bad bacteria that antibiotics wouldn’t clear up. Their consultant suggested raw milk, as part of the child’s diet, and within three months, the infection had gone"
"Raw milk consists of important enzymes that aid in assimilating the nutrients present in milk. Possibly the most important is lactase enzyme that helps digest lactose milk sugar. We have lots of customers who thought they couldn’t have dairy as they are lactose intolerant, really enjoying milk again. Maybe it’s a case that they are pasteurized milk intolerant?" "Raw milk serves as one of the best sources for calcium consumption." "One of the major raw milk drinking advantages is that it contains the beneficial bacteria both in terms of gut health and fighting infection, which otherwise get destroyed, when the milk undergoes pasteurisation process." "The British journal The Lancet reported that resistance to tuberculosis increased in children fed raw milk instead of pasteurised." "Drinking raw milk could reduce children's risk of suffering allergy-related conditions such as eczema and hay fever. This seems to be the main medical reason for people wanting raw milk today. Milk straight from the cow is full of bacteria. These all get killed by pasteurization, resulting in pasteurized milk containing lots of dead bacteria. Is it true that as these dead bacteria decompose and breakdown in pasteurized milk they release histamine that can cause eczema? We have lots of customers that have told us that within three weeks of having our raw milk, their eczema has gone." Milk has sugar for energy in the form of LACTOSE (80% of the carbohydrate in milk) which, studies have found, does much less damage than glucose to teeth. Milk also contains casein which is a phosphoprotein and considered to be a protective factor in teeth health to prevent caries. It does this by it’s ability to concentrate calcium and phosphorus in the plaque with the effect of reducing some of the plaque bacteria. Furthermore, when milk is from organic grass fed cows, which is usually the case with certified raw milk, the calcium in the milk is of the highest quality. That means your body will be able to make the most use of it to produce strong teeth and bones. Put the bottle of milk immediately into a fridge, and keep below 4C. 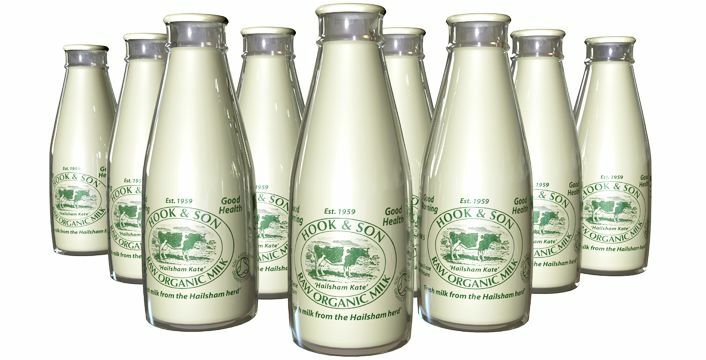 Remember raw milk has not been pasteurised and should be kept cold. If you have more milk than you will use in the first three or four days of receiving your milk, we suggest that you freeze the surplus milk so that you have fresh milk later on in the week. Freezing does not affect the milk quality, but do allow room for it to expand. Raw milk is not homogenised. Therefore, if left overnight in the fridge, the cream will rise to the top. In the morning, you will notice a cream line, the creamy top part of the bottle is fantastic with cereals in the morning, and aromatic coffee. The bottom part of the bottle would be similar to semi - skimmed milk, as most of the cream has risen to the top of the bottle. This is great for drinking whole, making milk shakes, and cups of tea. If you wish to disperse the cream evenly in the milk, then the bottle will need to be shaken before use.